Should an historian act as a judge, pronouncing verdicts on the past? Should a judge express views about the past or even use the past for his judgments? How can legal history help judges? Can you imagine that knowing about the history of medieval canon law, a subject seemingly quite distant from modern times, can prepare someone to become a respected judge? For a moment you might think I seduce you to follow me in an experiment, but I had rather tell here about the experiences of a scholar and judge who dealt in his life with exactly the questions at the start of this post. On April 17, 2017 John T. Noonan Jr. died. He served for thirty years as a judge of the Ninth U.S. Circuit Court of Appeals in San Francisco. Before and during his period as a judge he did research in the field of medieval and modern canon law. Noonan (1926-2017) wrote also about American law in past and present. A number of obituaries have appeared which focus on his contributions as a judge. Here I would like to honour his achievements by looking at his work as a legal historian. The obituaries I have seen until now understandably focus on his work as a judge. In particular the obituary issued by the Ninth Circuit Court of Appeals mentions a number of major cases – with full references – to which Noonan contributed, sometimes with a dissenting opinion which was eventually followed by the Supreme Court of the United States. Even Wikipedia gives substantial quotes from these important cases in the article about Noonan. The obituaries in the San Francisco Chronicle and The New York Times single out his political independence. Noonan was a Catholic who opposed abortion, but he certainly could not be labelled conservative. In the Commonweal Magazine‘s obituary there is attention for Noonan’s clear views about liberalism, but also on Shakespeare and the lack of attention to the Bard’s religion. The Faculty Lounge has a short notice by Alfred Brophy about Noonan’s passing, but he redeems it by sending you to a moving tribute at the blog of Diane Marie Amann (University of Georgia). She goes straight to the heart of the matter by showing Noonan in action. If you prefer to skip the section here below about the impact of medieval canon law you are right to proceed to her fine post. Noonan came from Boston and studied at Harvard University, Cambridge and the Catholic University of America. To mention only his academic posts, he was a professor at Notre Dame University between 1961 and 1966 and from 1967 onwards at the University of California at Berkeley (Boalt Hall). His first book was on a subject touching medieval canon law, theology and economic history, The scholastic analysis of usury (Cambridge, MA, 1957). In a modern textbook about medieval views of the economy [Diana Wood, Medieval economic thought (Cambridge, etc., 2002)] the two chapters about usury frequently refer you to Noonan’s book. Intention is one of the keys in understanding and defining usury and interest. His second book, Contraception. A history of its treatment by the Catholic theologians and canonists (Cambridge, MA, 1965; enlarged edition, 1986) appeared at a crucial moment in the history of the Catholic Church, in the aftermath of the Second Vatican Council when pope Paul VI created a commission to study contraception. He invited Noonan to participate in it as a consultant. Another study, too, brought medieval theology and canon law together [Power to dissolve. Lawyers and marriage in the courts of the Roman curia (Cambridge, MA, 1972)]. How authors come to a subject can be mysterious, but I think it is not entirely by chance that Noonan wrote about matters of life and death, in particular about moral conduct. Bonds dissolved or not are also at stake in his book on The Antelope : the ordeal of the recaptured Africans in the administrations of James Monroe and John Quincy Adams (Berkeley-Los Angeles, 1977). I could not resist going to the digital collection Slavery in America – discussed here in some detail last year – and to check for the presence of this case around a ship with slaves in 1820. Changing views on slavery are among the subjects in his study A Church that can and cannot change. The development of Catholic moral teaching (Notre Dame, IN, 2005). The personal conduct of judges through the centuries is the subject of Bribes. The intellectual history of a moral idea (New York, 1984). Many students of American law will know about his volumes with selected cases around religious freedom and the responsibilities of lawyers. It is tempting to discuss here more of Noonan’s books which discuss developments in American law from a historical perspective, but I promised you to focus on medieval canon law. A fair number of Noonan’s articles can conveniently be consulted in the volume Canons and canonists in context (Goldbach 1997). Articles about medieval canon law appear not only in the few journals created for this field, but also elsewhere, sometimes in Festschriften. Thus the volumes in this series are most useful, also for the additions and corrections added by the authors. The bibliographical database of the Regesta Imperii (Akademie der Wissenschaften, Mainz) lists most of Noonan’s articles about medieval canon law. Noonan wrote two major articles about the author of the Decretum Gratiani, a subject at the heart of the modern study of medieval canon law, because Gratian’s book is often seen as the core and cause of the very birth of medieval canon law. In the first article, ‘Was Gratian approved at Ferentino?’, Bulletin of Medieval Canon Law N.S. 6 (1976) 15-28, he investigates the historical evidence around a papal approbation of Gratian’s textbook. The second article, ‘Gratian slept here: the changing identity of the father of the systematic study of canon law’, Traditio 35 (1979) 145-172, is an object lesson in making distinctions about reliable and unreliable evidence. Noonan crushes sloppy thinking and careless repetition of unchecked information. Even his colleague at Berkeley, Stephan Kuttner, receives a frown at one point. Thirty years later Anders Winroth could establish at last some facts about the life of Gratian with certainty in ‘Where Gratian Slept: The Life and Death of the Father of Canon Law’, Zeitschrift der Savigny-Stiftung für Rechtsgeschichte. Kanonistische Abteilung 99 (2013) 105-128. Kenneth Pennington gives at his website a more colourful presentation of John Noonan’s work on Gratian, including the covers of some books and some remarkable photographs of Noonan. Intention is a matter of concern in medieval canon law ever since its appearance in the twelfth century as a subject in medieval theology. It is through canon law that intention became a theme in criminal law. Judges were called upon to consider someone’s intentions. Stephan Kuttner, Noonan’s teacher in Washington, D.C., wrote the classic study tracing this development [Kanonistische Schuldlehre von Gratian bis auf die Dekretalen Gregors IX systematisch auf Grund der handschriftlichen Quellen dargestellt (Città del Vaticano 1935)] and Noonan clearly studied it in great depth. For Noonan the facts and intentions counted in judging historical situations. In his view facts matter indeed, because he wanted to judge cases, not persons. Some of his views of famous American judges can be found in Persons and masks of the law : Cardozo, Holmes, Jefferson, and Wythe as makers of the masks (New York, 1976). Noonan did not keep ethics and moral questions at a safe distance. Making the right judgments is only possible when knowledge of the law, insight into what consist justice and a fine-tuned and ever developing conscience come into action, or to put it more briefly, where mind and heart fully work together. It is exactly how Noonan impressed those who met him. Being a judge and a historian in one person is challenging, but he had the greatness to achieve this in a long and fruitful life. This entry was posted in Scholars and tagged Economic history, Legal history, Medieval canon law, Slavery, Theology, United States of America on April 24, 2017 by rechtsgeschiedenis. The Middle Ages span a millennium, and the very term has long darkened our understanding of this period in European history. Somehow the image of the Dark Age keeps to some extent its force for children, the general public and scholars alike. Seemingly out of the dark come the persons whose names we know, and romantic phantasy has often been very active to make them as colourful as possible. Clovis, Charlemagne, William the Conqueror and Saint Louis, the holy French king pronouncing the law, are among the people for whom we can find out more than only battles, deeds and orders, but we hear seldom the voice of more ordinary people. Thus the counsels of Dhuoda to her son, the visions and songs of abbess and composer Hildegard von Bingen, and Christine de Pisan, a passionate writer and defender of women, stand out even stronger, because they shed light on the history of women, too. In the field of medieval art there has been a hunt to find traces of individual artists. Some works of art still bear their names, but others remain anonymous. Medieval law, too, can seem not only a very masculine, but also a very impersonal affair. However, juridical glosses from the twelfth century in the manuscripts with the main texts of Roman and canon law are sometimes signed with an abbreviated form of the names of lawyers such as Azo, Jacobus Bassianus, Rogerius and Pillius. In the last decades another hunt has brought some astonishing results. Scholars have been able to identify autograph manuscripts of a surprising number of medieval lawyers. Individual scholars succeeded in connecting one or more manuscripts directly to the author of a particular juridical text. Surprisingly this is indeed possible for medieval lawyers, for many scholars not the group in medieval society you would immediately pinpoint. On February 8, 2017 the second volume of a series of studies about medieval autograph manuscripts will be presented at the École française de Rome. This post is a small tribute to the scholars contributing to these volumes, and especially to Giovanna Murano, the courageous editor who has set an example herself in approaching legal manuscripts with new questions and sharing her wisdom and results with others. The blog Storia del Diritto medievale e moderno alerted me to the presentation of the new volume, and apart from translating the main information of their message in French I will try to provide some context for this important publication. During the thirteenth century a system for the reproduction of medieval texts used at universities came into existence. Book shops were given controlled master copies, exemplars of these texts. Students could hire quire after quire for scribes to make copies. The pecia system – literally “piece” – was first described for theological manuscripts by Jean Destrez. Last year Frank Soetermeer died, the Dutch scholar who did research about the use of the pecia system for legal texts in Italy and France. Giovanna Murano, too published a book about the pecia system, Opere diffuse per exemplar e pecia (Turnhout 2005). Since a few decades it becomes clear that the chances for survival of original author manuscripts were relatively high. In the sixteenth century, however, printers often discarded the very manuscript(s) they had used to produce printed versions of texts. Recognizing the handwriting of a specific author can be easy, but first you have to connect an inimitable script with him or her. The almost illegible script of Thomas Aquinas (circa 1225-1274) got nicknamed littera inintelligibilis by his contemporaries, and the mirror writing of Leonardo da Vinci in the fifteenth century is rightly famous. Medieval lawyers signed in particular charters, acts written on parchment, or added some confirming lines in their own hand to consilia, legal consultations. The cover of the new volume shows a consilium with some of such closing lines and signatures. The interest in these consilia has helped very much to make the identification of the handwriting of medieval lawyers possible. Perhaps the single most important step was the identification of a set of autograph manuscripts in the Vatican Library written by or produced under the direction of Baldo degli Ubaldi (1327-1400), first signalled by Giancarlo Vallone, ‘La raccolta Barberini dei “consilia” originali di Baldo’, Rivista di Storia del Diritto Italiano 62 (1989) 75-135. You can read online (PDF, 9 MB) an article by Vincenzo Colli, ‘Collezioni d’autore di Baldo degli Ubaldi nel MS Biblioteca Apostolica Vaticana, Barb. lat. 1398’, Ius Commune 25 (1998) 323-346. Twenty years ago Colli identified more autographs and other manuscripts close to their author for other medieval lawyers as well, for example for Guillelmus Duranti (around 1237-1296), the author of the Speculum iudiciale, a massive legal encyclopaedia, ‘L’apografo dello Speculum iudiciale di Guillaume Durand’, Ius Commune 23 (1996) 271-280 (online, PDF, 3 MB), and together with Giovanna Murano ‘Un codice d’autore con autografi di Giovanni d’Andrea (ms. Cesena, Biblioteca Malatestiana, S.II. 3)’, Ius Commune 24 (1997) 1-23 (online, PDF, 9 MB). In the second volume of the series on medieval autograph manuscripts [Autographa I.2: Giuristi, giudici e notai (sec. XII-XV), Giovanna Murano (ed.) (Imola 2016)] you will find some eighty images of medieval manuscripts, and very often you will see a medieval consilium and a manuscript of a particular work as evidence for the identification of an author’s hand. Apart from lawyers who published legal works the team looks also at medieval judges (giudici) and notaries (notai). For the second volume twelve scholars have identified 49 authors and consulted more than one thousand manuscripts in more than two hundred libraries. The new volumes contains eighty photographs. Giovanna Murano contributed an article about the autograph of Antonio de Roselli’s Monarchia for the second volume of the Festschrift for Mario Ascheri, Honos alit artes. Studi per il settantesimo compleanno di Mario Ascheri, Paola Maffei and Gian Maria Varanini (eds.) (4 vol., 2014), a publication briefly mentioned here, too, available in print and online. In the first volume a whole section is dedicated to articles concerning medieval legal consilia. Murano provides a must-read on this genre with her article ‘I consilia giuridici dalla tradizione manoscritta alla stampa’, Reti medievali. Rivista 15/1 (2014) 1-37. She offers an uptodate illustrated introduction to this medieval genre. It gives you an example of her rigorous thinking and dense argumentation. At every turn Murano makes you think and reconsider matters you had not thought about for a long time or simply not carefully enough. In a similar article she gives a status questionum for the study of the Decretum Gratiani, the great treatise for medieval canon law from the early twelfth century [‘Graziano e il Decretum nel secolo XII’, Rivista Internazionale di Diritto Comune 26 (2015) 61-139; online]. The first volume of the series Autographa appeared in 2012. In my view both volumes can serve also as a palaeographical atlas for anyone studying the learned law, i.e. the medieval – and Early Modern – use of Roman and canon law. Instead of hunting digitized manuscripts on your computer screen or tablet you might want to sit down and study the variety of handwriting offered by Murano and her international team. The books can be used indeed as a fine guide to medieval legal manuscripts. However, maybe it is simple the urge to come as closely as possible to the hands of the great magistri of Italian and French medieval universities that makes you want to have these books within your reach. The names of medieval lawyers change here from glorious but inevitable dead names into living persons, not just as law professors producing a theoretical frameworks for judges, advisors and officials all over Europe, but at work themselves, counseling parties or pronouncing judgment on cases which show law in action. These manuscripts and archival records offer a splendid window to medieval life and society. My warmest congratulations to Giovanna Murano and the scholars participating in this great project! It deserves your attention by all means. In 2018 a third volume of the Autographa series appeared on Donne, sante e madonne : 1 : (da Matilde di Canossa ad Artemisia Gentilschi) (Imola 2018). This entry was posted in Manuscripts, Scholars and tagged Consilia, Italy, Legal history, Manuscripts, Medieval canon law, Medieval history, Medieval law, Palaeography, Roman law on February 7, 2017 by rechtsgeschiedenis. When you would ask me to single out any legal historian for his or her versatility, path-breaking articles and books, stimulating teaching and generous help I would answer that choosing anyone would mean that I seriously underestimate the qualities of a lot of other fine scholars. On November 29 Harvard Law Today published an article about the honours lately bestowed upon Charles Donahue. In October a conference was held to celebrate his efforts in the field of legal history, both for the history of the common law and medieval canon law. This last field offered me the original impulse to start my blog, and therefore it is fitting to create space for a truly great scholar. John Witte, Sara McDougall and Anna di Robilante edited a Festschrift called Texts and Contexts in Legal History: Essays in Honor of Charles Donahue (Berkeley, CA, 2016). Remarkably this volume does not yet figure on the website of the publishing institution, the Robbins Collection at Berkeley’s School of Law. Its website might be in the midst of a substantial makeover, including the launch of a new website for the manuscript catalogue, but this surely is an omission, yet another reason to get into action here. In this post I will focus mainly on Donahue’s work for the history of canon law, but you will not mind reading some remarks about other periods and themes which received and receive his attention. A third reason for writing this post is the opportunity to look at two most interesting projects for digitizing archival records which form a wonderful window to the practice of medieval canon law. My most vivid memory of Charles Donahue is the way he presented a paper at the International Congress of Medieval Canon Law in 1996 at Syracuse, NY. He commented on the needs to combine the qualities of research into legal doctrine, ecclesiastical institutions and social history. The three of them benefit immensely by being studied together, not in isolation. Of course this is a huge challenge, but Donahue memorably ended saying: “Let’s get out here and do it!” He did indeed exactly what he announced. One of the challenges is having the courage and stamina to work at all in a field like the history of medieval canon law which is both utterly fascinating and bewildering in its complexity. Critical text editions are still scarce, and you might be the first scholar since decades to look at particular manuscripts, or literally the first in centuries to study archival records. In order to assess the possibilities to use archival records from medieval church courts Donahue set out to create a survey of these records with reports by a team of scholars from all over the world, The Records of the Medieval Ecclesiastical Courts: Reports of the Working Group on Church Courts Records (2 vol., Berlin 1989-1994). Earlier on he published with Norma Adams Select Cases from the Ecclesiastical Courts of the Province of Canterbury, c. 1200–1301 (London 1981; Selden Society Publications, 95). A recurring theme in a number of his publications is medieval marriage. In 2008 Donahue’s great study Law, Marriage, and Society in the Later Middle Ages: Arguments about Marriage in Five Courts appeared. Cambridge University Press provides online access to some 300 additional pages with notes and texts. The five courts in this work are York, Ely, Paris, Cambrai and Brussels. At his Harvard homepage you can download Excel sheets from the databases with the materials from these courts. Sharing these data with other scholars is wonderful when you realize how much work it takes over many years to prepare these materials before you can execute the kind of study Donahue did. For one of the dioceses Donahue studied in his great book about medieval marriage, law and society you can now access documents online. Surprisingly there are even two connected projects which bring you to ecclesiastical justice in the medieval archdiocese of York. The first project to come online was The Cause Papers in the Diocesan Courts of the Archbishopric of York, 1300-1858, the fruit of cooperation between the University of York, in particular the Borthwick Institute for Archives, the Andrew Mellon Foundation, History Online and JISC. The Borthwick Institute provides you with background information about the digitized records. It is also instructive to read entries at the project blog which ended in 2011 with the launch of the database. The Cause Papers can also be searched online at the portal Connected Histories. It is a bit weird to see at this portal the label Local records applied to both the Cause Papers and the Proceedings of the Old Bailey. It is precisely a strength that they are also important sources for local history, but they can bring those investigating them much more. The core of the project for the York Cause Papers (CP) is the database which allow you to search more than 15,000 cases from many perspectives. For a number of cause papers images are provided, but I cannot determine the algorithm or human reasons behind the selection. Looking for cases after 1500 can bring you to images of the records involved. Earlier on the Borthwick Instituted had published guides to the cause papers, W.J. Sheils, Ecclesiastical Cause Papers at York: files transmitted on appeal 1500-1883 (Borthwick Texts & Calendars 9, 1983), D.M. Smith, Ecclesiastical Cause Papers at York: the Court of York 1301-1399 (Borthwick Texts & Calendars 14, 1988), and D.M. Smith, The Court of York 1400-1499: a handlist of the cause papers and an index to the archiepiscopal court books (Borthwick Texts & Calendars 29, 2003). At the website of the Borthwick Institute is also a very useful guide to records from other courts at Carlisle, Chester, Durham, Sodor, the diocese of the Hebrides, and Man, all of them, however, for the period after 1500. The database of the Cause Papers brings you to summarized information about the cases dealt with in these records. If you want to look in it for matrimonial cases you will see at least 1,600 cases from four centuries. A search with the keyword matrimonial brought me 241 results between 1300 and 1500. Donahue prepares for the Selden Society the volume Select cases from the ecclesiastical courts of York, 1300-1500 which will contain some 400 cases from the Cause Papers. The medieval records themselves are at the center of a second project at York, York Archbishops’ Registers Revealed, The digitized registers cover the period 1225 to 1646. The contents here are much wider than only legal cases, but they, too, appear. As one of the showcases in the background information you can look at documents concerning the divorce of king Henry VIII from Anne of Cleves in 1540 (Abp Reg 28, f. 142r). For this project 32 registers have been digitized (Abp Reg) and also five Institution act books (Abp Inst AB) from the sixteenth and seventeenth century. You can browse a particular register and browse for people, religious institutions and groups. locations and subjects, or use the free text search field. A simple search for marriage yielded some 300 results. Supplementary indexes exist already for three registers. These indexes are rather important. When you look under A for Anne of Cleves she is absent in the database because in the standard view only input from indexed registers is shown. You cannot reach directly for records for people not included in these indexes. It is evident that the case from 1540 was found using earlier indexes, and primarily the historical overview of matters at the beginning of a register. The need for indexing some forty registers with 21,000 digitized images is clear and just as important as compliance with IIIF, the initiative for interoperability between images from various sources, rightly advocated in this project. Having the digitized images in front of you on your screen is great, but some of the classic activities of the historian’s craft are still indispensable, if only for deciphering the texts. Maybe I can seduce you to have a look at ‘Under a magnifying glass’, a recent post on my second blog Glossae concerning juridical glosses from the twelfth century, where I compare a number of online tutorials for medieval palaeography. By the way, the Borthwick Institute has also started digitizing seventeenth-century visitation records from York. For yet another diocese in medieval England, London, you can consult at home records thanks to the Consistory database created by Shannon McSheffrey (Concordia University, Montreal) using registers covering the periods 1467-1476 and 1487-1496. The database contains transcriptions and translations of documents for this last period. McSheffrey helpfully provides a generous bibliography of modern scholarship about late medieval civil and ecclesiastical courts in England. McSheffrey provides introductions to major themes in the cases from London, such as defamation, marriage and divorce, tithes, testaments, clerical behaviour, and matters as debt and perjury. You can approach the cases directly or look for specific subjects, people, locations, and also for depositions. The variety in possible approaches to these records is not new for those already familiar with medieval canon law, but surely this range of subjects covered by ecclesiastical law should make more people curious about canon law. Among the supporting institutions of the Canadian Consistory project is the Ames Foundation, since many years led at Harvard by Charles Donahue. One of the online resources of the Ames Foundation are the page proofs of The Register of the Official of the Bishop of Ely: 21 March 1374 – 28 February 1382 edited by Marcia Stentz and Charles Donahue. I had used the word opus magnum for Donahue’s book on the comparative history of medieval marriage courts, but this edition deserves this description, too. Marcia Stentz’ calendar of the Ely register formed the starting point for a full critical edition. As an asset the Ames Foundation has also put online digital images of this register [Cambridge, Cambridge University Library, Ely Diocesan Records, EDR D2/1]. Establishing a correct numbering of all pages in this register is just one of the myriad things needed to pursue the long road to the final edition. At the first folio the Ely register has the heading Registrum primum causarum consistorii episcopi Eliensis (..), but this register does not contain solely cases heard in an ecclesiastical court. Other tasks and actions of an officialis, the episcopal judge, come into view, too. I leave it to my readers to see for themselves the recent additions concerning medieval canon law among the online publications of the Ames Foundation, a remarkable feature of a society promoting the history of English law! You will also spot Charles Donahue’s name for his support for the online edition of Appeals to the Privy Council from the American Colonies: An Annotated Digital Catalogue, edited by Sharon O’Connor and Mary Bilder, but his work for the Ames Foundation reaches beyond specific editions. When reading this contribution you will notice with me a great variety in editorial approaches for online editions or presentations of late medieval church court records. The Cause Papers of York are accessible in a database, but you will find for cases before 1500 only detailed summaries of cases. The range over the centuries is great. I would view it as a search tool. York Archbishops’ Registers Revealed does give you access to digitized images, but the online indexation of the records has not yet been completed. Here you will need medieval and Early Modern palaeography, and you have documents from an even longer time span. The Consistory database for diocesan records from London offers you detailed access to transcriptions and even translations, but for just one decade. Here you can quickly focus on the cases. The edition of the Ely register is certainly both a classic edition enhanced with images, and in a way it is in a class of its own. The context of an ecclesiastical judge during eight years is here right in front of you. Depending on your personal interest as a scholar or teacher you will sometimes prefer a full edition, to provide either students with a quick road to a first encounter with a source, or inversely make the importance of auxiliary sciences clear by showing images of historical records. Each approach is to some extent perfectly valid and valuable. Space forbids me to discuss here the editions by Monique Vleeschouwers-Van Melkebeek for Cambrai and Brussels of records of the officialis, let alone her work on Tournai with probably the earliest surviving records from the late twelfth century. Donahue does use these sources, too. At the end of this contribution I am sure that Charles Donahue would very much want to make this extensive comparison of editions in print and online. Of course I could only point to some aspects of Donahue’s work. It makes me eager to look at his work in more depth! Studying medieval law is one of the means to discover the great differences of law and society in place and time during a millennium. It teaches you to be wary about rapid generalizations and labels. I confess to be charmed and sometimes very much moved by the records of medieval courts and the way they can be made tell-tale witnesses of society at large, of life in all its dimensions, of people trying to lead their lives. Somehow human interest is the greatest when you see people facing the machineries of the law, be they cunning plaintiffs, helpless defendants, shrewd or wise lawyers. 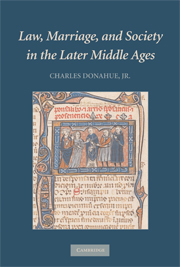 In its best incarnations as in the work of Charles Donahue studying and writing about medieval canon law is both part of legal history and the humanities. Please forget my grumblings about the manuscripts catalogue of the Robbins Collections! In 2018 the new searchable database version was launched. It can now readily respond to many inquiries. This entry was posted in Digital editions, Scholars and tagged Digital archives, France, Legal history, Low Countries, Medieval canon law, Medieval procedure, Palaeography, Social history, United Kingdom on December 7, 2016 by rechtsgeschiedenis. In this century several major research libraries and national libraries have started to digitize their manuscript collections. On my blog I have reported for instance about digitized legal manuscripts in the British Library. Legal manuscripts were included also in the project Europeana Regia for the reconstruction of the medieval royal libraries. One of my earliest posts concerned the Swiss project e-codices. More recently I wrote here about digitized manuscripts from Chartres and the Mont Saint-Michel. The digitized medieval and Renaissance legal manuscripts at the Collegio di Spagna in Bologna did not escape my attention, too. In 2013 the project at UCLA for the Catalogue of Digitized Medieval Manuscripts came to a halt because the two courageous scholars responsible for this project could not cope anymore with the tasks of creating a consistent and yet detailed catalogue. The question how to find out about the presence of digitized manuscripts is not easily answered. For one particular massive project there is a way to stay informed. The current digitization project for the manuscripts of the Vatican Library has made considerable progress. Already some three thousand manuscripts can now be viewed online. However, this library did until this week not publish lists of recent additions. How can you stay informed about manuscripts which might interest you? In this contribution I will look at the efforts of Jean-Baptiste Piggin, a journalist and historian in New-Zealand, who since 2015 has patiently reported at his blog Macro-Typography about recently added digitized items. His service to scholars and the general public deserves our thanks and admiration. For your convenience I have put together a list of the legal manuscripts Piggin signalled until now. Piggin himself is interested in the history and use of diagrams, including those created by medieval lawyers, and this offers me a chance to write here about legal iconography, too. At Twitter you can find Piggin, too (@JBPIggin). The collections of the Biblioteca Apostolica Vaticana (BAV) in Vatican City are truly extraordinary. Not only their sheer number is immense, but also the presence of many remarkable manuscripts make this library an institution beyond repositories elsewhere. During its long existence the BAV was able to acquire entire manuscript collections. The Palatini came from the ducal library at Heidelberg, the Ottoboniani from cardinal Ottoboni, the Urbinati from Urbino, the Chigiani from the Chigi family, and these are just a few examples. Luckily there are even special bibliographies for the modern scholarly literature about these manuscripts. The BAV has created a separate online manuscript catalogue. The main digitization project of the BAV has several sister projects, for example for Syriac and Chinese manuscripts. The most important accompanying project deals with the Palatini latini, some 2,000 Latin manuscripts originally kept at Heidelberg, and now digitized and only accessible online at the portal Bibliotheca Palatina digital of the Universitätsbibliothek Heidelberg. With the advanced search mode of the Palatina Search you can directly search for particular manuscripts. For the subject Recht you will find some 220 digitized manuscripts, but alas it turns out this search does not yield the result you would expect, because not only legal texts show up. Using filters such as Pal. lat. does help somewhat, but in my view it is not correct when the filters Justiz and Kanonistik give almost completely identical search results. The fact you can find individual texts within a manuscript is not only welcome, but simply necessary. The overview of Palatini latini is organized in some twenty lists with each one hundred manuscripts. Arranging by year, author or title does help a bit. However, a check with the lists’ view at Heidelberg makes clear you can confine your search for legal manuscripts among the Palatini latini mainly to the shelfmarks Pal. lat 621 to 800. The university library at Heidelberg has a separate website for searching images in the Palatini manuscripts. Having the Palatina Search at your disposal is really useful and important when you look at Piggin’s series of posts with digitized Palatini latini. It would be a herculean task to add for each manuscript in his lists a short or long description. For the Palatini Piggin often gives the author’s name and the title of a work. So far Piggin has counted some 3,200 digitized manuscripts from the BAV. In his early posts he did not include complete lists. Until now he mentioned on his blog some sixty Palatini latini with legal texts. By the way, at the end of each post Piggin asks for comments and additions from people who know more about newly digitized manuscripts. Apart from the Palatini latini Piggin mentions I have now a list in front of me with 33 legal manuscripts. This number puzzles me a lot. Stephan Kuttner and Reinhard Elze published two volumes of their Catalogue of canon and Roman law manuscripts in the Vatican Library, I: Codices Vaticani latini 541-2299, II: Codices Vaticani Latini 2300-2746 (Città del Vaticano 1986-1987). These two volumes should have been followed by three consecutive volumes, but for various reasons this has not yet happened. Gero Dolezalek and Martin Bertram have put PDF’s with the draft galley proofs of the third volume online. They bring us to Vat. lat. 11527. A similar project for other manuscript collections at the BAV is one of the projects that will bear fruits in particular for the field of medieval canon law. The overviews created by Brendan McManus for medieval canon law texts, the Manuscripta Iuridica database at Frankfurt am Main for texts concerning Roman and feudal law, and the Initia operum iuris canonici medii aevi of Giovanna Murano are at many points much more concise for manuscripts held at the Vatican Library. With this information at our disposal I should really look again at the nearly fifty (!) posts Piggin published and check them against these combined resources. For my consolation I can only remark that you will have to perform a similar task when you want to know about for example medieval medical or mathematical manuscripts at the Biblioteca Apostolica Vaticana. The presentation of these manuscripts differs from a short notice to a much fuller description for some of them. “Lotte Kéry” refers to her repertory Canonical collections of the Early Middle Ages (ca. 400–1140) : a bibliographical guide to the manuscripts and literature (Washington, D.C., 1999), partially digitized by The Company with the Search Engine. Trismegistos is a database for ancient papyri and inscriptions. I will expand later on Piggin’s interest in diagrams. Borgh. 348, collection of opinions written in 1320 for Pope John XXII before 14th-century decision to extend inquisition to practitioners of “black magic” in southern France. Notes >> a reference to Annelies Maier, Ausgehendes Mittelalter III (Rome 1977) 208. Borgh. 374: A 13th-century text of the Emperor Justinian’s legal codifications including the Institutions, annotated by medieval lawyers. Justinian was emperor at Constantinople 527-565. >> Institutiones, Novellae, Libri Feudorum and Tres Libri (Codex 10-12). Ross. 555, a beautiful Hebrew codex with four fine Italian miniatures. From Evelyn Cohen I read that this is Jacob ben Asher’s legal treatise, the Arba’ah Turim, and that the images depict a synagogue scene, animals being slaughtered according to Jewish ritual, a wedding and a courtroom scene. Piggin very sensible enlivens his lists with small format images of often remarkable illuminations, but to keep it here within sensible length I have excised the images and his remarks, except for those concerning legal trees such as the arbor consanguinitatis. In a post about digitized manuscripts in Bologna I have looked at the Mosaico project and its section about the Arbor actionum, the “Tree of actions”, a tool designed for determining which legal action(s) you should choose. Among legal diagrams Piggin looks in particular at the arbores consanguinitatis et affinitatis, and he proposes some substantial revisions of the views expressed by Hermann Schadt in his classic study Die Darstellungen der Arbores Consanguinitatis und der Arbores Affinitatis : Bildschemata in juristischen Handschriften (Tübingen 1982). Piggin published a post about legal arbores, and he has even has written an accompanying guide, The Missing Manual: Schadt’s Arbores. The virtual exhibition Illuminating the Law of the Fitzwilliam Museum in Cambridge shows some examples of these arbores. Piggin questions the very use of the word tree and invites scholars to look more closely and use terms carefully. In Piggin’s notes the sheer variety of manuscripts faithfully mirrors the wealth of the manuscript collections at the BAV. For the field of legal history I have included also some items concerning the papal inquisition (Borgh. lat. 348, Vat. lat. 3978 and 12732) and some papal records (Reg. lat. 189 and Urb. lat. 1057). The manuscript Vat. lat. 3740 with questions concerning apostolic poverty reminded me of Umberto Eco’s The Name of the Rose and this subject as a bone of contention figuring in his novel. DigiVatLib does in many cases include at least some bibliographical information with which you can start further exploration of a manuscript. Apart from his interest in legal iconography Piggin explores the origin of the use of diagrams with stemmata. I can only admire his tenacious approach and the way he blogs about his research in ancient and medieval history. The main results of his research appear at his own website. One of his latest blog posts concerns the text of a medieval commentary on biblical arbores humani generis, a kind of genealogical schemes showing the genealogy of Christ. The text seems to have been overlooked because it only filled gaps in drawings. It seems the kind of discovery only made by those who look at things supposedly well-known with an ever open mind. While finishing this post the staff of DigiVatLib is busy transferring digitized manuscripts and incunabula to a new platform with enhanced interoperability. There have been complaints presence of large watermarks on the digitized images. It is also remarkable to see an interface for English, Italian and Japanese. There is now an advanced search mode with even fuzzy filters (“partial match”). You can tick a field for non-digitized items and choose to search only manuscripts. The galleries with selected manuscripts and the twenty latest digitized items wet your appetite for more. Twice every month you can get at Piggin’s blog a preview of newly digitized manuscripts. Even if it is possible to correct and expand his notes on legal manuscripts, you must admit that creating commented lists does at least provide useful orientation. Perhaps some legal historian might take up the challenge of providing a regular list of updates for digitized legal manuscripts at the BAV with sufficient information to start benefiting truly from this massive digitization project. This entry was posted in Manuscripts and tagged Canon law, Digital libraries, Italy, Legal history, Legal iconography, Medieval canon law, Medieval law, Medieval procedure, Roman law on May 18, 2016 by rechtsgeschiedenis. Languages can act as formidable barriers to our understanding of both past and present. Even if you happen to have a talent for foreign languages translations can help you in many ways to gain insight into the messages and form of a source. In medieval Europe many legal sources were written or only accessible in Latin. However, a number of medieval legal texts have been translated into the vernacular. In this post I want to look at a number of medieval translations of such sources and at two modern translation projects. Recent news about these projects offers me an occasion to write about this subject. In the Middle Ages translating the works of Aristoteles from Greek – or Arabic – into Latin formed probably the largest translation project of a millennium. The volumes with the scholarly edition of the Aristoteles Latinus project are still being published. For many scientific disciplines medieval translators took the trouble of translating important sources. In the field of law, too, one can point to translations. The most massive project, the Basilica, is not only a translation but also an adaptation of Justinian’s Institutes, his Digest, Codex and the Novellae. For some parts of the Justinian codification older Greek translations exist which the translators around 900 used in Byzance. A team at the University of Groningen led by H.J. Scheltema produced a modern critical edition of the text and the scholia, the accompanying glosses [Basilicorum libri LX (17 vol., Groningen 1953-1988)]. A very interesting example of a translated medieval legal text is Lo Codi, a legal commentary from the twelfth century originally written in Occitan, a language spoken in Southern France and Catalonia. Lo Codi has been translated in French, Castilian, Latin and Franco-Provencal. I wanted to check information about this text at the homepage of Johannes Kabatek at the Universität Tübingen. Since his move to Zürich this page has been removed, but luckily he has put them on his private website. At this webpage you can compare different manuscripts and versions. An article about Lo Codi by Kabatek from 2000 is also available online (PDF). Kabatek does show Lo Codi is an independent adaptation of the Summa Trecensis, and not just a translation. The first large-scale project I want to introduce in this post is The Medieval Nordic Legal Dictionary, a project led by the University of Aberdeen. Not only a dictionary will be the fruit of this project, but also translations of Scandinavian laws. Two volumes with translated laws have already appeared. A few years ago I wrote here about medieval Scandinavian laws, and it is surely helpful to be able to use these translations alongside the original texts. The page for laws of this project provides you with a quick overview of the main laws. the current editions and the planned or already published translations. The bibliography of the dictionary project shows that luckily for some texts translations appeared in the twentieth century, however, in a number of cases into current Icelandic, Norwegian, Danish or Swedish. Some medieval legal texts have been translated in the sixteenth century. This month I saw an announcement for a lecture in Paris on April 6, 2016 by Patrick Arabeyre (École nationale des Chartes, Paris) on ‘Deux exemples de traduction vers le latin dans le domaine juridique : la traduction d’ordonnances royales par Étienne Aufréri (1513) et la traduction des Coutumes d’Orléans par Jean Pyrrhus d’Angleberme (1517)’ as a part of a conference on La traduction en vernaculaire entre Moyen Âge et Renaissance. The first subject of his lecture were royal ordinances edited by Étienne Aufréri in 1513, and he looked also at the translation by D’Angleberme of the Coutumes d’Orléans (1517). A second lecture by Frédéric Duval, also attached to the ENC, concerned the versions of Lo Codi. In April 2015 Duval presented a paper about French translations of the Corpus Iuris Civilis. Nowadays the French Biblissima portal is a fine gateway to several projects concerning the production and transmission of manuscripts, and using the English interface it is very much accessible. One of the online databases at the École nationale des Chartes is called Miroir des classiques, “Mirror of the Classics”, a project in which Duval participates. Unfortunately this database does not yet contain any notice about translated legal texts, but eventually they will be included. How can one trace more medieval translations? For Ancien Français, one of the phases of medieval French, there just happens to be a resource that can help you. The bibliography of the Dictionnaire Étymologique de l’Ancien Français (DEAF) does lead you to a number of translations, many of them still only existing in manuscripts. The section C of this bibliography shows for example two thirteenth-century translations of the Code de Justinien. The entry at CodiFr mentions Lo Codi and states flatly this is a translation of the Codex Justinianus, a notice clearly in need of some updating. Under the letter I you will find both a complete translation of the Institutiones Iustiniani and an abridged version. Five manuscripts exist with a French translation of the Digestae. The Summa Codicis of Azo, too, exists in a French version, the Somme Acé. By the way, you can find a number of online dictionaries and textual corpora at the website of the Dictionnaire de Moyen Français. For the field of medieval canon law one has to single out the medieval French translation of the Decretum Gratiani. This translation has been edited by Leena Lofstedt, Gratiani Decretum. La traduction en ancien français du Décret de Gratien (5 vol., Helsinki, 1992-2001). I have not taken a complete tour of the sources of the DEAF, but it is certainly rewarding to look for yourself, and not only for matters concerning France. Anglo-Norman texts appear here, too. Searching in manuscript catalogues will no doubt yield further results. A search in the digital catalogue for archives and manuscripts of the British Library brought me to ms. Royal 20 D IX, a late thirteenth-century French translation of the Authenticum and the Tres Libri, the books 10-12 of the Codex Justinianus. The database Manuscripta Iuridica at Frankfurt am Main contains for example for the French translation of the Institutes – usefully put together as Institutiones Justiniani, versio Gallica – references to thirteen manuscripts. The manuscript in London, too, has not escaped the attention of Gero Dolezalek and Hans van de Wouw, the creators of the Verzeichnis der Handschriften zum römischen Recht bis 1600 (4 vol., Frankfurt am Main 1972) used for the database, nor did they miss the French version of the Digestum Vetus, and the Infortiatum. For Azo you will find not only the translation of his Summa Codicis, but also a translation of his summa on the Digesta. Five years ago the last of the twelve volumes of the modern Dutch translation of the Corpus Iuris Civilis appeared. I wrote here a post about the presentation of the final volume in 2011, and in that post I looked also at other complete translations of the Corpus Iuris Civilis. On Friday April 15, 2016 yet another volume was presented at a symposium in Utrecht. Jop Spruit, the indefatigable founder of the project, translated with Jeroen Chorus also the Libri Feudorum, a twelfth-century text from Lombardy concerning customary law dealing with fiefs. Kees Bezemer wrote the introduction to this translation with facing Latin text. In my view the translators wisely choose to follow the version of the Libri Feudorum as found within the Corpus Iuris Civilis. One of the arguments to include this work on customary law into the curriculum of the medieval law schools was the presence of glosses by Accursius. The modern critical edition gives both the oldest and the most used version (Vulgata) [Karl Lehmann (ed. ), Das Langobardische Lehnrecht, (Handschriften, Textentwicklung, ältester Text und Vulgattext, nebst den capitula extraordinaria (Göttingen 1896; online in the Internet Archive)]. However, more versions came into existence. At the symposium in Utrecht Jeroen Chorus gave a talk about possession in the Libri Feudorum. Dirk Heirbaut compared the feudal law in the Libri Feudorum, the Leenrecht van Vlaanderen and the Lehnrecht of the Sachsenspiegel. Rik Opsommer discussed the use of the Libri Feudorum in the practice of Flemish feudal law, and Kees Bezemer looked at the role of feudal law in Early Modern Europe with a focus on a case in seventeenth-century Germany which became the subject of a disputation defended at Frankfurt an der Oder. The best point of depart to start exploring Early Modern German juridical disputations is the digital library of the Max-Planck-Institut für europäische Rechtsgeschichte, Frankfurt am Main. The team of Dutch translators hesitated about the right number of the latest volume in the series of translated texts of Roman law. Twelve is such a beautiful number suggesting completeness! They finally opted for 12 Addendum. The set of twelve volumes can still be ordered from Amsterdam University Press. Until now I have looked almost in vain for other translations of the Libri Feudorum. The translation by Lorenz Weidmann, Die Lehensrecht verdeutscht (…) was printed at least seven times between 1530 and 1541. The German bibliographical project VD 16 does not only make such statements possible, but it leads you also to the digital version of the first edition Augsburg 1530 (Munich, Bayerische Staatsbibliothek). Robert Feenstra wrote about it in his article ‘Kaiserliche Lehnrechte. Die Libri feudorum in deutscher Fassung nach Alvarotus und andere Inkunabeldrucke zum Lehnrecht. Mit Beiträgen über Johannes de Vanckel und die casus summarii des Baldus’, Tijdschrift voor Rechtsgeschiedenis 63 (1995) 337-354. There is also an online version of a translation by Jodocus Pflanzmann printed in an incunabula edition, Das buch der lehenrecht (Augsburg 1493; GW 7776). The Gesamtkatalog der Wiegendrucke (Staatsbibliothek zu Berlin) has a useful overview of editions and partial editions before 1501 of the Corpus Iuris Civilis. GW 7654 is a French translation printed at Paris around 1486 of Justinian’s Institutes, interestingly made in verses. The identification of the probable author, Richard d’Annebaut, is also given in the bibliography of the DEAF with references to the unique manuscript source, London, British Library, ms. Harley 4777. Discussing the Libri Feudorum is entering a territory where three decades ago things might have seemed straightforward. Things have changed very much since Peter Weimar’s article ‘Die Handschriften der Libri feudorum und seine Glossen’, Rivista Internazionale di Diritto Comune 1 (1990) 31-98, reprinted in his volume of essays Zur Renaissance der Rechtswissenschaft im Mittelalter (Goldbach 1997) 171-238, and the study of Gérard Giordanengo, Le droit féodal dans les pays de droit écrit. L’exemple de la Provence et du Dauphiné XIIe – début XIVe siècle (Rome 1988). I must refer you here to online bibliographies such as the one provided by the Regesta Imperii at Mainz to see how much has been written recently about the approach of medieval lawyers to feudal law. Of course it is possible to use modern translations of medieval legal texts, but in this post I wanted to investigate medieval translations. For searching modern translation one can benefit from the Online Medieval Sources Bibliography which even offers filters for translations containing also the original texts, translations in English, French or other languages. It might be helpful to end here with briefly noting the publication of the revised edition of Fred Blume’s translation of Justinian’s Code edited by Bruce Frier [The Codex of Justinian (3 vol., Cambridge, etc., 2016)]. The German translation project for the Corpus Iuris Civilis reached in 2012 its fifth volume with the books 28 to 34 of the Digest, edited by Rolf Knütel [Corpus Iuris Civilis, Band 5, Digesten 28-34 (Heidelberg 2012)]. Let’s hope the leaders and translators of such projects will and can benefit from the recent Dutch experience in completing a book project with nearly nine thousand pages. Frédéric Duval will present in June 2016 a paper about the late-medieval translations into French of parts of the Corpus Iuris Civilis at a two-day conference in Tours, Les traductions médiévales à la Renaissance et les auto-traductions (Tours, June 8-9, 2016). In 2017 the Miroir des classiques project of Duval contains very detailed information also for medieval French translations of legal texts. This entry was posted in Scholars and tagged Customary law, France, Legal history, Medieval canon law, Medieval law, Netherlands, Roman law, Scandinavia, Translations on April 18, 2016 by rechtsgeschiedenis. The death of Umberto Eco (1932-2016) makes the world mourn a most versatile author. In fact you might do him justice by seeing him almost as a true uomo universale. In his writings, both his scholarly work and his novels, the thing resonating within you long afterwards was and is the encounter with a mind full of curiosity about the world, culture and life at large. As a small contribution in remembrance of a great intellectual I will look here at a few aspects of a period close to his heart, the Middle Ages. With The Name of the Rose Eco did not only write a great detective novel and a philosophical treatise about visions of reality and truth, but he returned in a way to the territory where his career started. This novel is marked by elements of law and justice, reason enough to have a look at it here. Eco’s great story, set in the early fourteenth century, has not just one central narrative thread, the quest of William of Baskerville and his assistant Adso of Melk to solve crimes and the mysteries surrounding them. The Name of the Rose is also a book about confrontations between old and new ways of thinking and action, and of strife even between people at both sides. The Franciscan William of Baskerville meets a formidable opponent when the Dominican friar and inquisitor Bernard Gui arrives on the scene of the monastery in Northern Italy. Both religious orders came into existence shortly after 1200. They almost fought each other to receive able men into their ranks. The different ways of living and preaching inspired them to outshine each other. Now Bernard Gui (around 1262-1331) was a historical figure. Interestingly he was not only the most famous inquisitor of his time, but also a very active historian of his order, see A.-M. Lamarrigue, Bernard Gui. Un historien et sa méthode (Paris, 2000). 800 years ago the Dominican order was founded. Part of the worldwide jubilee celebrations is the virtual exhibition A pipeline from heaven: eight centuries of Dominican books created by Cambridge University Library. Among the manuscripts shown in the online gallery you can find the Summa Theologiae, the major work produced by Thomas Aquinas. I searched in this exhibit in vain for the inquisition and Bernard Gui, but let’s first remember how Eco started as a scholar with writing about Thomas Aquinas. Eco’s Ph.D. thesis dealt with the views on art of this Dominican philosopher and theologian. Aquinas wrote many of his works using the scholastic method of distinctions using questions and answers. Argument after argument is dissected in a seemingly cool and calm way. Personal views or involvement seldom surface. Eco succeeded in pinpointing Aquinas’ views of art in his discussions of perception, contrary to the opinions of eminent scholars such as Étienne Gilson and Jacques Maritain. Once you realize this, it is easier to see how this discovery influenced Eco’s later scholarly and literary works. When William of Baskerville reads and explains the telling signs which contain clues to unravel what happened at the Benedictine monastery infected by crime, Eco knowingly plays with scholarly views of medieval and modern philosophy. Using and focusing on signs was for some time the very heart of the vogue for microhistory. The Italian word connected with the microhistory paradigm is spie, traces. Eco was virtually the founder – together with Roland Barthes – of semiotics, the theory of signs, their meanings and relations. In the thirteenth century a number of Dominican friars set out to write both manuals and encyclopedias covering all kinds of knowledge. Very soon the papacy realized that their deep theological knowledge made these friars fit to become inquisitors. Bernard Gui himself wrote a manual for inquisitors, edited by Michel Mollat, Bernard Gui. Manuel de l’inquisiteur (Paris 1926, reprint 1964; Les classiques de l’histoire de France au moyen âge, 8-9). Gui made notes and instructions and carefully documented his activity in the Languedoc in another manuscript [Le livre des sentences de l’inquisiteur Bernard Gui (1308-1323), Annette Pales-Gobillard (ed.) (Paris 2002)]. David Burr (Virginia Tech) has translated a number of the texts in this edition, in particular Gui’s views on detecting heresy. Gui mentions among other heretical matters the views on poverty of the Franciscan writer Petrus Olivi which figure in Eco’s novel, too. As part of the Dutch jubilee celebrations of the Dominican order the journal Tijdschrift voor Geestelijk Leven [Journal for Spiritual Life] published a special about Dominican history [Het hart op de tong. 800 jaar dominicaanse verkondiging (TGL 72/1 (2016)] with an article by legal historian and theologian Daniela Müller (Radboud Universiteit Nijmegen) on Bernard Gui (pp. 27-35), summarizing in Dutch at the same time a part of her recent research about medieval heresy and the position of women. Müller writes Gui served his order also as a procurator generalis at the papal court in Avignon, and even became involved in the canonisation of Thomas Aquinas. He also acted as a papal nuntius. Müller’s recent research about Gui’s protest against the decision of pope Clement V compelling bishops and inquisitors to work together is real news (see her article ‘Der Bischof und der Inquisitor’, in: Ketzer und Kirche. Betrachtungen aus zwei Jahrtausenden, Daniela Müller (ed.) (Münster 2014) 237-262). For Bernard Gui words and views did not stand independent of beliefs and practices. You might say he read the views of people as signs of religious convictions and adherence. He outright connected particular expressions with heretical views, even if he had not yet asked specifically about the latter. Eco succeeded most powerfully in showing one of the major faults of the inquisitorial procedure, the combination of the function of persecuting officer and judge in one person. Is it a play on his own name – Eco means echo in Italian – that the other main character in The Name of the Rose, Jorge of Burgos, the monk killing so many of his brethren, also acted as a staunch persecutor of new views and a terrible self-appointed judge? Eco would have spoilt his novel by placing the motto Only connect used by Virginia Woolf at the start of his first novel, but surely this is the most concise clue to his book. Eco involved himself in Italian life and culture with his own column for a newspaper and regular appearances on television. In a number of his books, for example about the history of beauty, he left behind him his familiar territories of medieval history and current philosophy, and reached out to a much larger audience. Among these books I personally most like his work touching on the history of language research, La ricerca della lingua perfetta nella cultura europea (1993), translated into nearly twenty languages, as you can check in the Index Translationum of UNESCO. The history of the search for the perfect language brought Eco in many cases to authors expressing their own theory about the original language of humanity. Even Dutch was in the seventeenth century sometimes presented as the language spoken in Paradise! Having started with studying the world where Latin was the lingua franca this subject certainly made Eco smile. His command of European languages made him the ideal author for this theme. I first read The Name of the Rose as a student of medieval history. Although I did find at first his proliferation of extracts from medieval authors close to going through an overturned card file I had no doubt whatsoever of his skills as a great story-teller. The joy of writing and sharing is visible everywhere in his writings. Since I first read this book I have reread it several times, and my admiration for it has grown. While writing this post I noticed how many tags I can use for classifying my musings about Eco. We are lucky to see in Umberto Eco someone defying normal classifications. He was a great scholar, and even his faults and flaws have turned into art. Few scholars have been as candid and full of humour as Eco about his own mistakes. Nobody is perfect, but Eco’s legacy will continue to help us perceiving signs, detecting hidden perceptions and connections. He makes you transcend the world of books and marvel at the Book of the World. This entry was posted in Manuscripts, Scholars and tagged Cultural heritage, European history, Italy, Legal history, Literature, Medieval canon law, Medieval law, Medieval procedure, Religious history, Women's history on February 21, 2016 by rechtsgeschiedenis.